Introduction While driving north on I-35W to check out the progress on the new Saint Anthony Falls Bridge, I happened to take a photo of downtown Minneapolis just as I was approaching the right-hand turn on I-35W. Despite shooting through my windshield, the photo turned out pretty nice. The key feature of this photo is that it was taken from a location that would be hard to duplicate on foot. 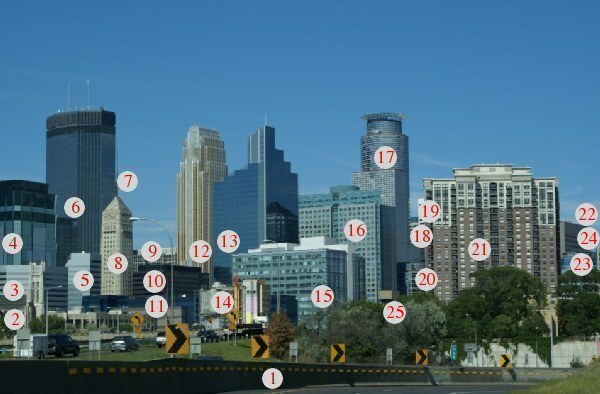 Click on any numbered dot or scroll down to read about each building. Note—you may need to open your browser window wider than normal to see the full picture. Click here for a large copy of the photo above without the numbered dots. #1 - I-35W Freeway I-35W is the major north-south freeway through Minneapolis, and the section south of the downtown area is the busiest road in the state with nearly 200,000 cars per day on the highway. When it was built, someone got the bright idea to put a sharp 90-degree corner on the freeway just as it enters the commons area with I-94 as the southern edge of downtown. #2 - Central Lutheran Church One of several churches located in downtown Minneapolis. The church was founded in 1917 and quickly grew. They built this neo-gothic cathedral starting in 1924, dedicating it on Palm Sunday in 1928. The church believes that it is the largest Lutheran church structure in the US. #3 - Kinnard Financial Center 17 story office building was built in 1986 for the Kinnard Investment Company. They do both retail and institutional investing. The building has had a history of vacant floors. Ruth's Chris is located on the ground floor. Building is part of 3 building complex with the AT&T Tower and Oracle Centre. #4 - AT&T Tower 34 story tower completed in 1991 is part of a 3 building complex with the Kinnard Center and Oracle Centre. The slanted glass is supposed to remind viewers of the microwave antennas that are typically placed at the top of AT&T buildings. Tenants include Wachovia Bank, Xcel Energy, and Fair Isaac (of FICO score fame). #5 - Oracle Centre Oracle leased much of the space in this 20 story building completed in 1984. As a result, they received naming rights. The building was previous known as International Center, and was 65% vacant when Oracle signed the deal. #6 - IDS Center Completed in 1974, the IDS Centre is 775 feet tall. It was the first modern skyscraper built in the Twin Cities. It was build for IDS Financial Services, which became American Express in 1984, which is now known as Ameriprise Financial. Ameriprise moved out of the IDS Center in 2002. Target Stores also used this as a headquarters until 2002. Today, the 57 story icon is occupied by smaller tenants who want a signature downtown address. #7 - 33 South Sixth Street This 52 story tower is 668 feet tall. It is the tallest building west of Nicollet Mall in downtown Minneapolis. It was formerly known as the Multifoods Tower. The namesake, International Multifoods, was sold off piece by piece in the late 1980s, with the final chunk going to Nestle. Tenants include Target and several large law firms. The lower levels feature the City Center Mall and a Marriott hotel. #8 - Foshay Tower The Foshay Tower is the original skyscraper in Minneapolis. It was finished in 1929 just in time for the stock market crash. At 447 feet tall and 32 floors, it was the tallest building in the upper Midwest until the the IDS Center opened. The tower reopened in 2008 as a hotel with a 31st floor observation deck. #9 - Investors Building The Investors Building is part of a 4 building complex known as the Baker Block along with the Baker, Roanoke, and Peavey Buildings. It originally called the Arcade Building. The first 5 floors were finished in 1927. A sixth floor was added in 1929. The 7th through 13th floors were added in the 1960s. The building was once home to International Multifoods, and later IDS Financial Services. The Baker Center is the backbone of the downtown skyway system. The complex features Peter's Grill, a retro style diner that is retro only because they haven't changed a thing since the 1960s. President Bill Clinton stopped in for lunch one Friday afternoon in 1995. #10 - TCF Tower TCF Tower is the home of TCF Bank. The bank started in 1923 as a building and loan association. It became a Savings and Loan, then switched to being a federal bank, and later, a national bank. The bank focuses on retail customers with smaller accounts. TCF pioneered being open first on Saturday, and later on Sunday at grocery store outlets. The 17 floor building has been renovated twice to keep up to date with a fresh look. #11 - Ameriprise Operations Center This 6 story building covers an entire city block. It is owned by Ameriprise, formerly IDS and formerly American Express. It houses their computer center, IT staff, and business operations. It is built as a building within a building. The inner building has large steel plates that can drop down over the windows in the event of a tornado or other issue. There are 4 railroad locomotive engines on the roof for backup power, with 2 running at any given time. There is also a huge diesel tank under the building to supply fuel to the generators. #12 - Wells Fargo Center The Northwestern National Bank Building once stood at this spot. It burned in 1982. The replacement building is this 774 foot tall art deco style masterpiece designed by Cesar Pelli. It opened as the Norwest Center. Norwest Bank was bought out Wells Fargo, but retained the Wells Fargo name and moved their HQ to California. Wells Fargo still maintains some space in the tower. The tower is lit up at night, with a shadow on the side that represents the old bank building. #13 - Campbell Mithun Tower This 42 floor glass tower was built in 1985 for Piper Jaffray, a local investment company. Piper Jaffray moved to a new building on Nicollet Mall. This tower then became a multi-tenant building. Advertising firm Campbell Mithun leased a number of floors and was granted naming rights to the building. As a result, it became the Campbell Mithun Tower in 2002. #14 - Hilton Garden Inn The Hilton Garden Inn is still under construction as of October, 2008. It is located very close to the convention center, so it cannot help but be successful. The building is located at the former site of the MN-DOT Traffic Management Center. The TMC moved to Roseville and their old building was demolished, making the space available. #15 - Ameriprise Client Service Center Completed in 2002, this 15 floor building was built for American Express Financial Advisors, now known as Ameriprise Financial. AM/EX had people spread across as many as 15 different buildings at one time. This building, which occupies an entire city block, allowed AM/EX to locate all of its customer support staff in one location. #16 - Ameriprise Financial Center This 31 story building was custom built for American Express Financial Advisors, now known as Ameriprise Financial. At 498 feet tall, it is the tallest single tenant building in the city. AM/EX was previously headquartered in the IDS Center, but had people in buildings all over downtown. When completed in 2000, it was a major step in AM/EX effort to consolidate along 3rd Avenue South. #17 - Capella Tower Building was developed in the late 1980s to be a new regional center for IBM. IBM suffered serious setbacks before the building was completed. When it opened, IBM occupied the side tower, and First Bank was the lead tenant. It was named First Bank Place, and later US Bancorp Center after the merger with United Bank. US Bancorp then bought Piper Jaffray, and moved their HQ to the new Piper Jaffray building on Nicollet Mall. The complex was renamed 225 South Sixth. Capella University expanded its space in the tower and was awarded naming rights. Signature feature of the 776 foot tall 56 floor building is the illuminated hat over the roof. #18 - 5th Street Towers The 5th Street Towers were developed by Opus and are mostly occupied by attorneys and professionals. Tower 1 was completed in 1987 at 26 floors, while Tower 2 was completed in 1988 at 36 floors. The taller tower is 504 feet tall. Both buildings have a common lobby, skyway level, parking ramp, and they feature green neon lighting that runs across the top of the towers. #19 - US Bank Plaza This two tower complex was built for Pillsbury in 1981 as the Pillsbury Center. Tower 1 is 41 floors and 561 feet tall, while tower 2 is 23 floors and 321 feet tall. Pillsbury was bought by General Mills and moved out of complex. US Bank leased the buildings and renamed the complex to US Bank Plaza. General Mills retains a small amount of space in the building. The balance of the space is occupied by several large law firms. #20 - Park Tower The Park Tower is a 20 story mid-rise tower that is part of the 225 South Sixth complex. The building was designed with two towers to reflect the two personalities of the lead tenants. IBM was the first tenant in the Park Tower. American Express Financial Advisors leased the IBM space in the late 1990s. #21 - Grant Park Grant Park is a large condo, townhome, and cityhome project built between 2002 and 2005. The main tower is 28 floors. 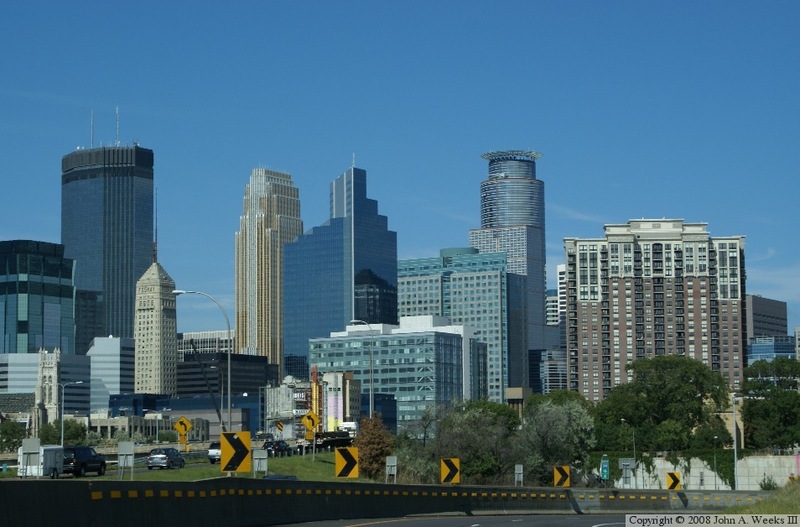 While the housing units are nice, and the building is attractive, it does block the view of a large section of downtown Minneapolis when viewed from the I-35W freeway. #22 - Hennepin County Government Center The Hennepin County Government Center is a 24 story tall building that houses county offices and county courts. It is built as two parallel towers connected by skyways. The towers are connected by a network of steel beans designed to strengthen the building against earthquakes. From the side, the building resembles the county logo, a large brown letter H.
#23 - 701 Building This 21 story glass mid-rise tower was built in 1984 for investment company Craig-Hallum, and was known as the Craig-Hallum tower. It was remodeled in 1996, and renamed the 701 Building as part of an image makeover. While the hexagonal design is interesting, the building has had a hard time attracting tenants. It was more than 60% vacant in 2007. #24 - Centre Village Completed in 1985, Centre Village is a unique combination of commercial and residential space. The building has a ground level retail area, skyway connections, parking ramp, Embassy Suites Hotel, 9 floors of condos, and then 3 stories of office space. The city participated in the development process to encourage housing in downtown and it operates the parking ramp. #25 - Energy Center The downtown Minneapolis Energy Center provides steam and cooling water to over 100 buildings in downtown Minneapolis. This is a much more efficient way to heat and cool buildings in an urban area than to have each building with its own energy infrastructure. NRG was formed in 1989 by a merger of several smaller regional energy companies.